Lamour records proudly presents Dr Jayne Insane, cutting through the thick mud with a dirty spoon. With three wonderful tunes on each side, this LP kills fascists… well, kills everything in near/in your ear. The noise grows on you. Comes with a poster by Sten Backman, who also made the art and design of the LP. Already started in 2008, Lamour is not just a label, but also a club, ‘with focus on curating multi-creative artistic crossings for artists, musicians and audience’. They probably didn’t release a lot of records, as they are up catalogue number 002 and 003 here. 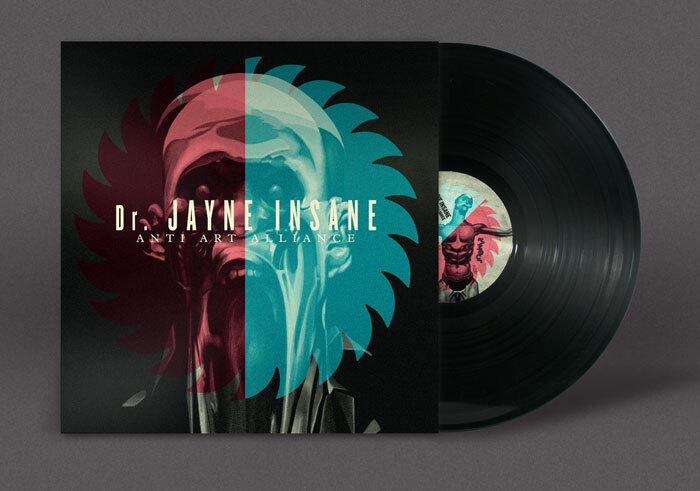 The latter takes the form of a LP by Jan Liljovic or Jan Liljekvist or Dr Jayne Insane as he is called here. On the press blurb we see with an amplified cello, but if he plays such a thing here on ‘Anti Art Alliance’ is doubtful. For some reason I keep thinking here about all those toy synths you see around these days, Monotrons, click on synths, nebulizer or whatever they are called, yet Dr Jayne Insane went into the EMS studio in Stockholm to record this record, so presumably this was in Studio 4 I would think, with its fine old analogue synths, the Bucla and the Serge. But what he gets out of this machines is loud and noisy, and actually sounds like ‘good noise’ to me. Not the kind of harsh noise that is The Wall, but of that noise yet intelligent kind. Here we have someone who composes with the noise available and does it well. It seems that this LP is actually quite short, but maybe that’s only how I perceive it. Play loud, I’d say. Too late to play this over christmas, but that would have been a blast.